We conclude the week with a brand-new review. It's for a game that I was quite looking forward to. To say I'm disappointed after my wait would be underselling things. 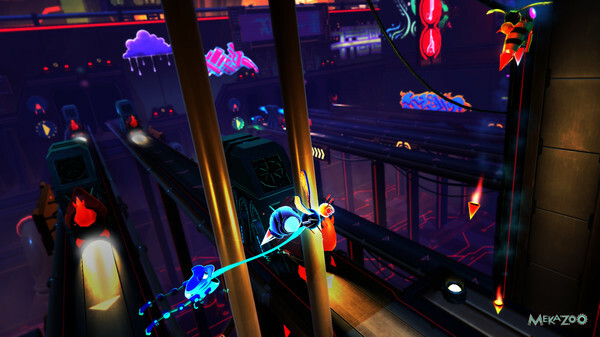 Here's my (hopefully fair) take on The Good Mood Creators' Mekazoo, reviewed on PlayStation 4. There are some games that come out that I absolutely want to love. They have a lot of effort put into them, they scream "charm", and they have the look of something terrific. Mekazoo was one of those games that I did indeed want to love, but for every good thing that came from it, something horrid got in the way of my enjoyment. 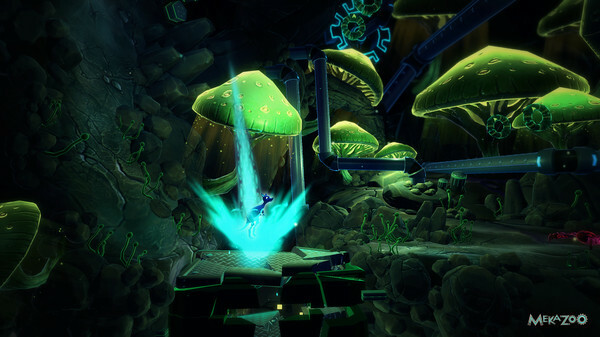 Mekazoo was developed by a team calling themselves "The Good Mood Creators." Ironically, on many occasions with my time with Mekazoo, all the developers and the game actually created for me was a bad mood. A real bad mood. 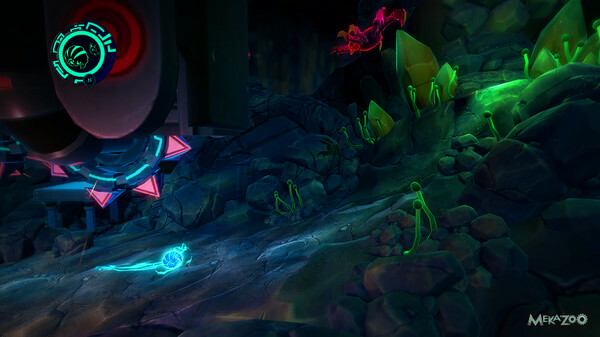 Mekazoo is a 2.5D platformer that has five hub worlds connecting all of the levels together. You start off as playing as a small armadillo, able to charge up and roll along floors, walls, and ramps to reach new areas. By the end of the game, you have five different animal companions on your side: the aforementioned armadillo, a frog, a wallaby, a bear, and a pelican. Each animal buddy has its own special ability to them. For example, the frog can use its tongue to lash out and defeat enemies, as well as grab onto special poles, enabling the frog to swing from them. Meanwhile, the wallaby (though a bit unwieldy) can bounce, jumping between walls. In Mekazoo, you begin with but a tiny armadillo, but even then, the game is quite interesting. There are approximately four main levels in each of the hub worlds, taking place in colorful forests, frozen tundras, cactus-filled deserts, futuristic cities, and sci-fi settings. Each level has a checklist of five tasks that you can complete to earn gears. Gears are the means to open new levels, so replaying levels is not only recommended, but it's also required. The first objective in a level is merely to clear it. You have an unlimited amount of lives to you, but checkpoints aren't as plentiful as I would like. It becomes monotonous and highly irritating to have to replay significant sections of levels due to the lack of checkpoints available. Other objectives include eliminating all of one type of enemy in a level, beating a level under a specific amount of time, clearing a level without dying, and finding a secret switcher. The direction you point the analog stick is the direction the frog's tongue will strike. The latter challenge presents a gameplay mechanic that I'd like to talk about. Despite being able to unlock five animals in Mekazoo, you can only have up to two animals to switch between at one time. The game makes it so you're given the right combination of animals to take on the next series of a given level's challenges. Many times with the "secret switcher" tasks, the switcher gives you an atypical duo of animal companions that make you rethink how you get through the level. One extra level is quite easy with the bear companion, allowing you to climb walls and such to reach the goal all the while a pool of muck rises under your feet. However, by using the secret switcher, you have to utilize the armadillo and wallaby, meaning that this otherwise accessible challenge becomes much more difficult. This requires learning how to charge the armadillo to roll up vertical walls and have the wallaby wall jump with extreme precision to avoid the black goop hot on your trail. Levels also possess gems to collect: four placed in usually hidden or hard-to-reach locations and four earned from collecting a specific amount of smaller gems. Finding and acquiring the gems are a lot of fun, and they make you explore the levels much more than you might otherwise do. These gems aren't just for collecting purposes either; they're used to purchase special costumes and themes for the various animal buddies of yours. Pounce from a high spot as the wallaby to destroy this floor. For the first few worlds, Mekazoo is a joy to play (for the most part). Then, myriad issues come to a head, almost like they were buried deep in the game as to not ruin impressions, word-of-mouth, and sales. In the fourth and fifth world, the frame-rate is absolutely atrocious-- As in, "no excuse that it is this bad" atrocious. It's compounded by the fact that trying to accomplish the challenging and precision-based platforming required to beat later levels is really difficult with said horrid frame-rate. the latter half of Mekazoo is underwhelming at best. Then, there are a multitude of glitches and bugs, many of which I've recorded and interspersed in this review. From not being able to grab onto poles that are clearly in reach to falling under a level, thus being stuck to restart the entire level, the glitches present in Mekazoo make for a frustrating experience on top of an already hard game. Don't get me started on the times when the camera is positioned horribly so you find yourself dying because the angle was off or if the camera even follows the action at all-- getting stuck on geometry for whatever reason. That's okay. I didn't want to finish the level anyway. Other than these issues, on many occurrences within later levels, I just didn't find myself being in full control of the animals. The controls feel loose to a detriment, and the physics aren't exactly perfect either. Many times there would be problems with character movement, clipping problems, and tough slow-down to deal with as you try to make precise maneuvers. Nevertheless, Mekazoo's overall presentation outside the highly disappointing frame-rate and bugs is rather fetching. The environments are bursting with color, vibrancy, personality, and brimming with character. The lighting is tremendous, offering an even greater sight to behold in the game's levels. The sound is also quite nice, delivering a heaping helping of terrific tunes, many of which I found myself either humming along with or bopping my head to. It's rare nowadays that I try to force myself to like a game, but Mekazoo was one of those. Despite all of its problems-- all of its immensely disappointing problems, I still find little specks of goodness within Mekazoo. The level design is well done, the charm is definitely present, and the longevity is clearly there if you have the patience to deal with everything else. As of now, though, I cannot in good conscience recommend Mekazoo until its multitude of technical problems get fixed. Mekazoo starts out as a highly enjoyable platforming romp that eventually just comes crashing down on itself. In this regard, it feels unfinished, and sadly, not worth buying at this moment. Review copy provided by The Good Mood Creators.